Laser activation of bonded IGBT. Activated Boron and Phosphorous dopant measured by SRP (courtesy FhI ISIT, Itzehoe). The VOLCANO® Laser Optics in combination with the JenLas® ASAMA laser is especially suited for activation of IGBT emitter and field stop layers. 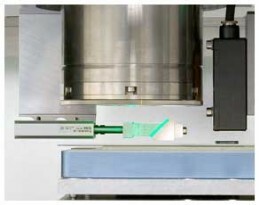 The pulse duration of the JenLas® ASAMA laser is selected for deep activation of the dopants and simultaneously prevents damage to the wafer front side or a protection tape. 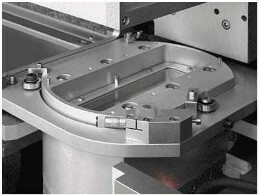 The depth of the activation process is precisely controlled by selecting the laser beam parameters pulse duration, line width and scan speed. The Phosphorous fieldstop layer can be activated up to 2 µm deep. 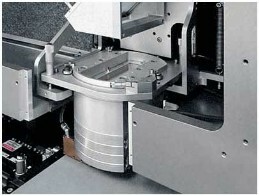 The VOLCANO® Laser Optics is either operated with a single or with two homogenizer coupled laser sources, depending on throughput requirements. 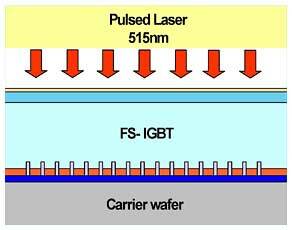 IGBT´s (insulated gate bipolar transistors) are processed on thinned wafers with a thickness of 100µm or less. Often these thinned wafers are mechanically stabilized by using the so-called TAIKO grinding process (DISCO Corp., Japan) and a protection tape on the already processed front side. This tape is not compatible with high process temperatures. If the activation is performed with the VOLCANO® semi IGBT Laser Optics, an activation rate of >75% can be achieved for both, the fieldstop and the emitter layer. The tape stays intact during this high temperature process. TM 7240, g200 or Revolution 40/80 combined with FALCON® line beam optics. VOLCANO® Laser Optics includes an integrated attenuator module to adjust the energy density at the substrate level. Power meter heads and a CCD camera based beam profile measurement are available. 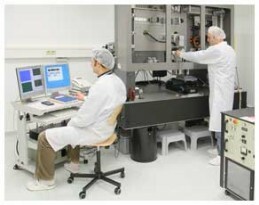 VOLCANO® Laser Optics has high availability (>90 %), is reliable and has low cost of ownership.